It´s easy to see, in Win 8 or 8.1 when running on the x32 (x86) or x64 installed version of Windows! Now you can see in the ControlPanel/System is the Windows-8 x32(x86) x32/x86 (32 bit) or x64 (32-bit) Edition! ... System requirements for Windows 8! ... How big should be the Windows 8 disk partition! System protection for Windows-8 . Advanced system settings in Windows-8 . 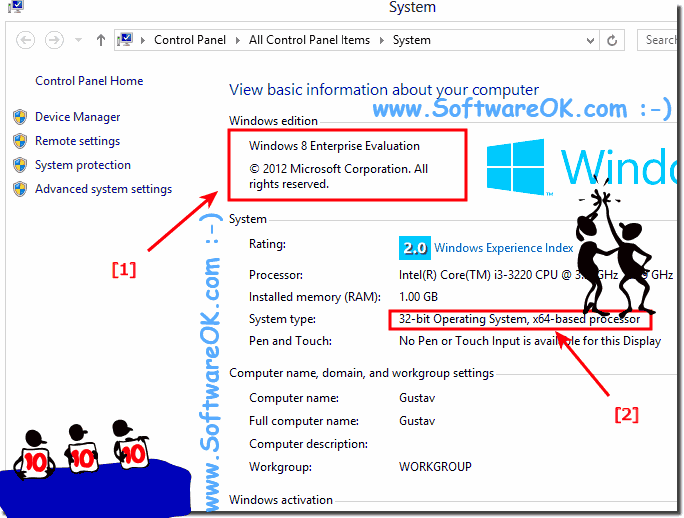 (Image-2) Windows-8 x32/x86 (32 bit) or x64 (32-bit) edition installed? Lists info about the version of Windows running on your computer. Displays your computer's Windows Experience Index base score, which is a number that describes the overall capability of your computer. Your computer's processor type, installed memory (RAM), system type, and pen and touch capabilities are also listed. Computer name, domain, and workgroup settings. Displays your computer's name and domain info. You can change this info and add user accounts by tapping or clicking Change settings. You might be asked for an admin password or to confirm your choice. Shows whether your copy of Windows is genuine, which helps prevent software piracy. The links in the left pane provide access to additional system settings. You need to be signed in, as an administrator, to change these settings. Change settings and update drivers. Change settings for Remote Desktop, which you can use to connect to a remote computer, and Remote Assistance, which you can use to invite someone to connect to your computer to help troubleshoot a problem. 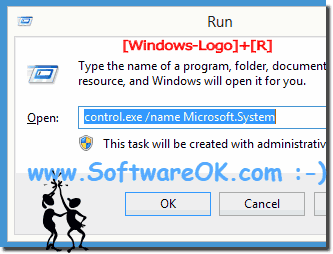 Manage settings that automatically create the restore point that System Restore uses. You can turn system protection on or off for the drives on your computer, and you can create restore points manually. Access advanced performance, user profile, and system startup settings, including Data Execution Prevention, which monitors programs and reports possible security attacks. You can also change your computer's virtual memory settings. Only the first and hidden win-8 administrator account on Windows 8 seven, 8.1brings a full access, by default it is not activated.